President Donald Trump has been talking about a border crisis for three years. Now he has the numbers to prove it, with border arrests spiking to the highest levels in a decade as growing crowds of migrants from Central America try to enter the U.S. But he might be wrong about why it’s happening.Trump is planning a visit to Calexico, Calif., on Friday as he blames Mexico for failing to stem the tide of migrants. Still, the forces driving Central American families and children northward are complex — and some think Trump’s hard-line immigration rhetoric could be making the problem worse. Border officials encountered an estimated 100,000 migrants in March, with families making up the bulk of that, according to preliminary figures. The tally suggests border traffic could return to the higher levels of the 1980s, 1990s and early 2000s. Migrants say they’re fleeing Honduras, Guatemala and El Salvador because they’re facing violent crime, extortion, hunger and poor job prospects at home. Some border-watchers say smugglers are dropping their prices because they’re competing with free “caravans” of migrants marching toward the border together. And others say migrants are choosing to make the crossing now because they fear that Trump’s tough policies will make it harder to get across later. “I don’t think there’s any one factor,” said Stephanie Leutert, director of University of Texas Mexico Security Initiative. However, she said, the underlying reason “has to be that the conditions in Central America have not gotten better.” Trump responded last week with a threat to close the border — which he’s now backed away from — and to cut at least $450 million in assistance to the Northern Triangle countries. His administration is pressing Congress for additional funding for border security and for legislation that makes it easier to detain and deport families and unaccompanied minors. And he declared a national emergency in February to access $6.7 billion in noncongressionally approved funds to build a border wall. But those measures don’t address many of the reasons for the sudden surge in migration. The aid that Trump is threatening to cut is designed to mitigate some of the poverty and violence that compel Central Americans to flee. El Salvador, Honduras and Guatemala have some of the highest homicide rates in the world. Crimes such as extortion, kidnapping, gender-based violence and gang recruitment continue to create instability. “There’s just a sense of hopelessness in the region,” said Adriana Beltrán, a director at the Washington Office on Latin America. “If you are a victim of violence, a victim of extortion, or if you are living in impoverished conditions and you feel your government isn’t addressing your needs … you look for protection, for safety, or for better conditions elsewhere.” The United Nations High Commissioner for Refugees conducted more than 400 interviews in January to determine the factors pushing migrants north. The interviews took place on an international bridge in Ciudad Hidalgo, Mexico, just across the border from Guatemala. A majority of those surveyed — 63 percent — said they had experienced violence or feared the threat of violence in their home countries. Seventy percent said they would face a threat to their lives or be at risk of violence if they returned home. Another major driver is a lack of access to food. The United Nations World Food Programme warned in August that drought had wiped out staple bean and maize crops on more than 1,000 square miles of farmland in the three countries, an area roughly equivalent to the state of Rhode Island. The organization said the crop losses would jeopardize the availability of food for roughly 2 million people. Some — including a former U.S. ambassador to Mexico — are also blaming Trump’s own hard-line policies for the migrant surge. Roberta Jacobson, an Obama appointee who resigned from the ambassadorship a little more than a year ago, said smugglers in the region have stressed a need to cross into the U.S. before it’s too late. Smugglers are telling migrants, “‘They may shut the border, Trump is getting tougher,’” Jacobson said. “‘If you don’t go now, you’ll never get in.’” The spike in border arrests in March came on the heels of Trump’s intense push to procure billions in funding for a wall on the border with Mexico, which led to a 35-day government shutdown. Migrant arrests rose higher only after Trump declared the national emergency in February as part of an attempt to steer money toward a wall. Trump’s zero-tolerance enforcement policy, which split apart migrant families from April to June last year, may also have fueled the rush of migrants to the border, said Andrew Selee, president of the nonpartisan Migration Policy Institute, which focuses on immigration and integration issues. Amid widespread criticism of the separations, Trump signed an executive order in June that called for families be kept together. Less than a week later, a federal judge ordered the administration to reunite parents and children who had been split apart. “All of the sort of policy overreach by the Trump administration that has had to be abandoned at different points, either for political reasons or because of court injunctions, has led to news cycles that tell people where some of the opportunities are to enter the United States,” Selee said. “And smugglers use this information.” Trump might be right that the policies of Mexico’s new leftist government may also be contributing to the situation. After a surge of Central American families and children arrived at the U.S.-Mexico border in 2014, Mexico stepped up its own immigration enforcement. Mexican authorities arrested nearly 186,000 migrants in fiscal year 2015, according Mexican government statistics — more than the 145,000 non-Mexican migrants arrested by U.S. Border Patrol during the same period. 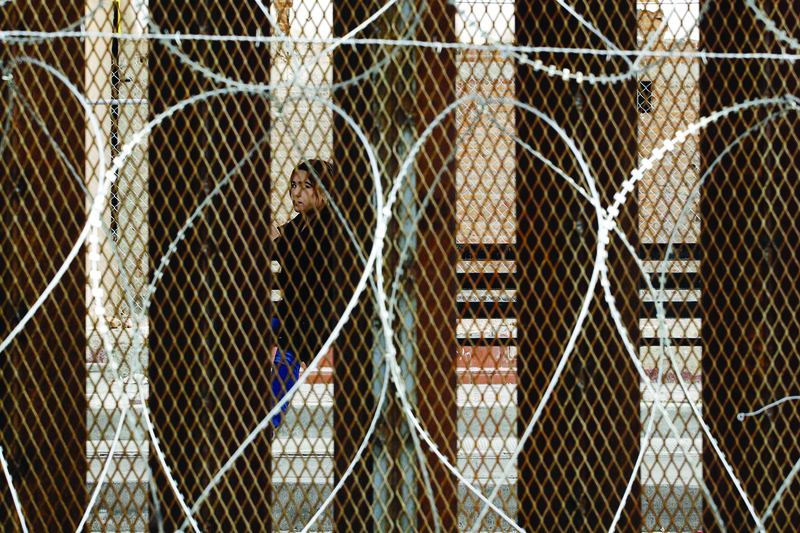 But while the cooperation largely continued during the first year of the Trump administration, the number of migrant arrests by Mexican authorities has fallen in recent months. Andrés Manuel López Obrador, who ran as a champion of the poor, assumed the presidency in December and has promoted a more welcoming message for migrants.